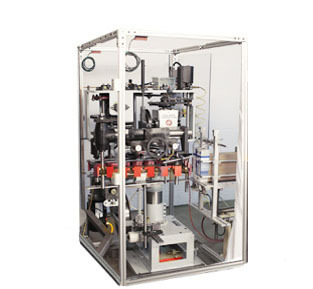 Seal-Spout spout inserting machines offer the highest degree of flexibility and reliability, with units in operation for more than 20 years. Our spout insertion machines integrate with most vertical cartoners and can be configured for both right-handed and left-handed operation. Operating at speeds of more than 280 cartons per minute, they can keep up with the highest-performance packaging lines. Our pour spout machines integrate with food packaging machinery and vertical cartoners from: Clybourn Cartoner, Yeaman Machine Technologies, Triangle Package Machinery Co., Tisma, ACMA and many others. Seal-Spout spout machines are designed to ensure the safety of food products and can be 100% washed down and steam cleaned. Whether you are using folding paperboard cartons or corrugated cartons, our spout inserting machines efficiently and reliably insert aluminum, plastic or paper spouts. Our pour spout equipment is designed to be customized for your particular needs and packaging system. Pour spouts and spout inserting machines are the most cost-effective packaging solution with spouts costing about $.01 per carton, depending on the application.